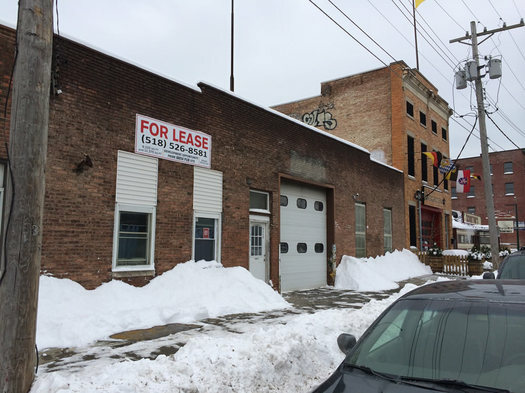 A plan for a new wine bar in a space along Broadway in Albany's Warehouse District is among a group of notable projects on the agenda for the city planning board meeting on February 18. So, let's have a look at some of the details. Mike Graney -- the owner of Graney's and Stout in Albany -- is proposing to build a wine bar in a warehouse space he owns at 897 Broadway. It's the building right next to Wolff's Biergarten, and across the street from Stout. 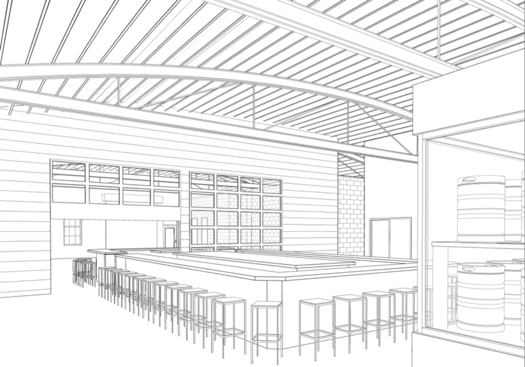 The wine bar would occupy roughly one-third of the warehouse space. And the plan is for the portion of the wine bar space closest to the street -- about 2,400 square feet -- to serve as an indoor/outdoor courtyard. "We're going to punch holes in the front of the building," said Jeff Buell of Sequence Development, which is managing the construction of the project. Buell said the plan includes large garage-style doors along the street side of the space, with new skylights in the roof. The idea is to create indoor/outdoor seating space in a spot where there's not a lot of room between the front of the building and the street. 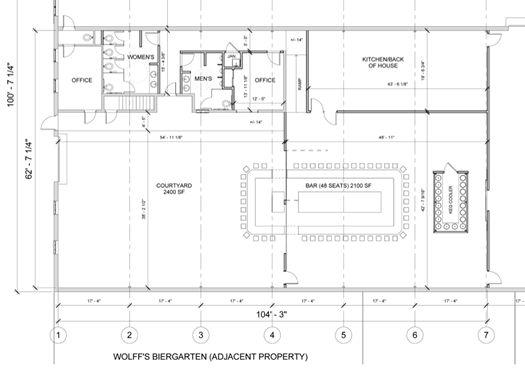 A floor plan from the application for the proposed wine bar space. The projected cost of the build is $600,000. The warehouse is currently empty, so Buell said there's not a lot of demolition that has to go on. (Here's a video from inside the space from last spring.) The projected completion date is sometime this summer, though that's dependent in part on getting approvals. The Warehouse District has been getting a lot of attention in recent years for its potential to transform from light industrial to something more mixed-use. And this wine bar would join a block that already includes Wolff's, Tanpopo Ramen & Sake Bar (in the old Miss Albany building), Nine Pin Cider Works, offices, and Stout across the street. And just a few blocks to the north is Druthers Brewing. "The Warehouse district has tons of potential that people are just starting to tap into," said Buell. This project at 897 Broadway is one of the first two to come up before the planning board under the city's recently-adopted Warehouse District Residential and Commercial Overlay. The new zoning guidelines grew out of the city's Rezone Albany project and they help smooth the way for uses such as restaurants, retail, and residential along the neighborhood's main corridors. Among the requirements of the overlay: projects need to include a plan for parking. And the application for 897 Broadway identifies parking across the street next to Stout, along with spaces the wine bar would be renting at the All-Lift property on the next block to the north. More potential development in the Warehouse District: The proposed plan to convert the old Rodgers Liquor Co. warehouse building at the corner of Broadway and Tivoli into apartments and a restaurant space is back up before the planning board. 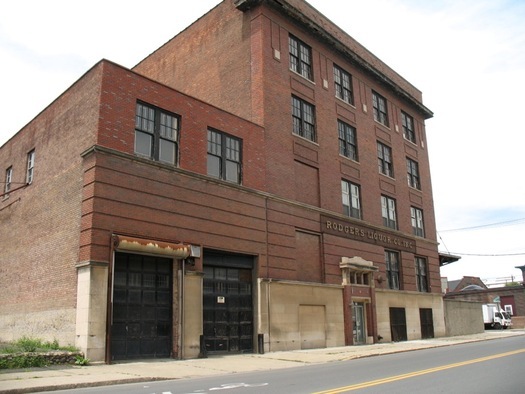 This project first bubbled up in the summer of 2014, and the plan from developer Bill Barber was highlighted by Preservation League of New York's Industrial Heritage Reuse Project. On the first floor, the proposed uses will consist of a Â±3,000 square foot restaurant with an entrance from Broadway, a lobby area for the apartments accessible from North Pearl Street, and one other proposed lease area totaling Â±2,000 square feet for a zoning compliant use, to be determined, within the two level brick building on the south side. The upper 3 floors are proposed as 24 apartments. Exterior alterations to the building include canopies at the building entrances, window repair and replacement, conversion of some loading dock doors into walls with windows, and general cleanup of the site. The existing loading dock on the north side is proposed for limited and seasonal outdoor dining as part of the restaurant and outdoor living space for the residential use. Interior alterations include structural repairs, new enclosed exit stairs, build-out of apartments and restaurant. The application also walks through the new zoning overlay parking requirements -- it figures the building requires 47 off-street parking spaces under the rules -- and states there are contracts to buy parking spaces near the building. 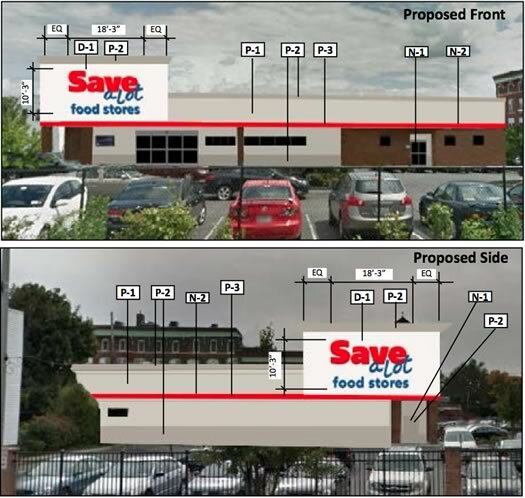 A depiction of what the exterior of the Save-A-Lot would look like from the the planning board application. Also on the planning board agenda: A proposed Save-A-Lot supermarket at 612 Central Ave (the corner of Central and West Lawrence). The site is currently an 18,700-square-foot Albany Med office building, the plan proposes to renovate the building into the supermarket. The developers are seeking variances for new signage and a reconfiguration of the loading dock. The Applicant proposes to construct a new 314 +/- bed student housing together with parking for 178 cars. included will be a clubhouse, fitness center and study rooms. This will require the resubdivision of the existing 1385 Washington Avenue and the existing No. 1389 Washington Avenue. Building will be 5 stories in heigh and will have a total height of approximately 55 +/- feet. The application is seeking a height variance, a parking lot permit, and special use permit for student housing. Apologies if I am confusing my news stories...but wasn't there once a brewery/restaurant planned for this area from the owner of Stout? Couldn't find it in the archives. Perhaps I'm confusing it with the Druthers construction. The fact that the 960 Broadway project includes apartments is great. That'll be the next step for the warehouse district. That, and hopefully other forms of entertainment. It's too bad that Save-a-Lot could not be located in a neighborhood more in need of a supermarket. Central Ave is hardly a food desert with Shop Rite not far up Central, Price Chopper and Hannaford somewhat farther, and the Honest Weight a couple of block off Central. I'm very happy to read about all of these projects, but it's shameful to include parking requirements in urban neighborhoods. We've tried that and it failed miserably. We're shooting ourselves in the foot by continuing this inappropriate requirement. I know the area isn't afood desert, but I'm a bit surprised there isn't an Aldi's somewhere in this city- shut out by Stewarts? I love how we require parking for places that serve products that impair the ability to drive safely. Apparently Save a Lot doesn't think the upper Central Avenue area is saturated with grocery stores. The good news is that there may be light at the end of the tunnel as it concerns parking minimums. The Rezone Albany initiative is looking at many issues in an effort to modernize and harmonize code within Albany, to include parking requirements. In fact, Module 2 was just released, which covers down on parking issues. I recommend all who are interested to give it a read and provide your feedback. We may not have a chance to speak to holistic development issues in our fair city for another 40 years.